Fruit Basket Pick. Eat. Repeat. PF 1 – The “PF” stands for Paul Friday, a contemporary peach breeder who has produced a number of outstanding varieties. PF 1 is his earliest maturing variety and the earliest peach you’ll find in the Valley. We can’t wait for peach season to start each year so we have planted a lot of these. They aren’t huge, but taste great and are ready to pick right around the 4th of July. Like all early peaches they cling to the pit somewhat but are great for fresh eating. Rich May – A very sweet peach with great, dark color for such an early variety. These are sometimes ready before our PF 1s, but are usually at their best a few days later. Garnet Beauty – Good size and great taste. Ready about a week after PF1. Early Redhaven – First of the freestone peaches! These are outstanding and are ready as early as July 10th, though the 15th is more typical. Classic Redhaven shape, size and taste. Not quite as dark as Redhaven, but ready about two weeks sooner. GaLa – A variety from the south that is firm and keeps well. 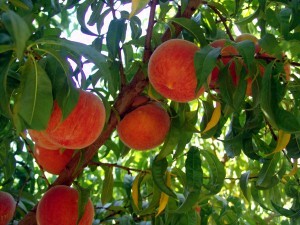 Redhaven – The classic variety that most people think of when they hear “Palisade peach”. Good size with great color and flavor and very little fuzz. A great peach for all uses. PF 15A – Beautiful, almost perfectly round peach that is great for eating fresh. PF 17 – Similar to PF 15A but a little later and larger. Glohaven – Sister of Redhaven with greater size and smooth skin. Red Globe – Very large and aromatic. A classic variety that tastes great and is big enough to share with a friend. Blushingstar (white) – Very pretty and sweet peach due to its low acid content. Pink skin and white flesh. Suncrest – Another classic variety that ripens in Mid-August. Good size and firmness so it keeps well and is great frozen or canned. PF 23 – The first variety release commercially by Paul Friday, known to produce large peaches. Our largest peach to date was a PF 23, weighing nearly 1.2 pounds! PF 24 – This one is actually the world record holder for a single peach – 1.6 pounds! Flamecrest – An uncommon variety with very smooth, dark skin. Cresthaven – A very pretty, bright orange peach that is very uniform in size. Elberta – Old time variety that is great for everything, especially canning. Tends to remain more yellow than other varieties and has a wonderful smell. JH Hale – One of the few peaches that actually requires a pollinator (most varieties are self-fertile). Nice, firm peaches that keep well and taste great. OHenry – One of the last varieties available in our area. These are very firm and dark – almost purple when fully ripe. Firebrite – Uniform dark red with no fuzz and just the right sweet/tart combination. Mid to late July. Emeraude – A wonderful white-fleshed nectarine that literally tastes like candy. Late July/early August. Flavortop – A large, yellow-fleshed variety that is ready in early August. Santa Rosa – Super sweet yellow flesh with a tangy red/purple skin. This is our earliest plum, usually picked in late July. 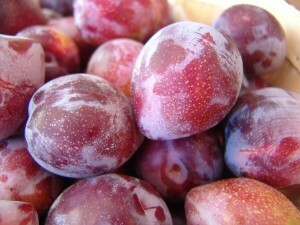 Duarte – A medium sized “blood” plum with juicy red flesh and purple skin. Ready to pick mid-August and great for eating fresh. Italian – Considered a prune plum, these have bright blue skin and greenish-yellow freestone flesh. Pretty good when eaten fresh but absolutely fantastic when dried. Elephant Heart – An old variety that matures very late, usually mid-September. These are large, freestone and have a distinctive flavor that’s worth the wait. Lapins – “Lapin” is French for “rabbit” and these are our best-producing variety. Lapins have a nice crunch even when fully ripe and keep well. Look for these to start our season around June 10th. Stella – A large, dark red cherry that ripens early with good firmness. Skeena – We just have a few of these and they are similar to Lapins in terms of firmness and size, but mature about 10 days later. Bing – Well-known variety with excellent size and flavor. Ranier – Planted in 2015, these will need a few years to start producing. Look forward to large yellow cherries with a pink blush and outstanding flavor. Attika – A very dark, heart-shaped cherry from the Czech Rebublic with a long, elegant stem. Hedelfingen – These are our latest sweet variety (end of June) and get very dark. Flavor is excellent but the softer flesh means you need to eat them quickly – usually not a problem! Montmorency – Excellent for pie, this tart variety has long been considered the industry standard. 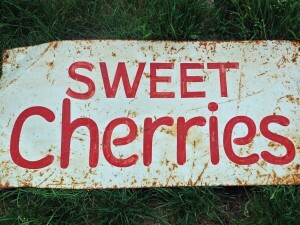 Balaton – A newer tart variety from Hungary that produces larger cherries; sweet enough to be eaten fresh. Whitney Crab – Our first apples of the season, coming in early to mid-August. We use this as a pollenizer for other varities, but the golf ball-sized apples are good for baking and sauce. Gala – A sweet, juicy, kid-sized apple that goes great in lunches or as a snack. Usually ready in mid/late August. 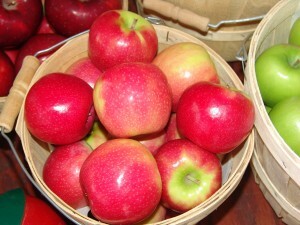 MacIntosh – Classic sweet/tart flavor that is a favorite for pies and caramel apples. Red MacIntosh – Same as standard MacIntosh but a uniform red color. Honeycrisp – We can’t grow enough of these! Everyone seems to love the crisp, unique flavor. Note they are early in the season and often gone by Labor Day. Cortland – A large, do-it-all apple that is really great for everything – pies, sauce, eating fresh. Slightly tart and doesn’t brown when cut (non-GMO). A great keeper, too. Jonathan – Small in size but big on flavor! Jonagold – You guessed it , these are a cross between Jonathan and Gold Delicious. Very sweet with just a hint of spicy tartness. Gold Delicious – Another great multi-purpose apple. Makes perfect sauce and great pie, especially when combined with a tart variety. Red Chief – A variety of Red Delicious that ripens earlier than Classic by about a week. Classic Red Delicious – Not like what you find in the store! Ours are sweet and crunchy. Superchief – Very similar and a little later than the classic variety, with better size. Empire – Spicy sweet flavor in a perfectly round package. Beautiful and yummy! Early Fuji – We can’t tell the difference between our early and late Fujis. They look and taste the same (excellent), but we pick these in mid-September, about six weeks before the late variety. Northern Spy – A complex, spicy taste sets these apart. Cameo – Rumored to be a cross between red and gold Delicious, these are a “freckled” variety that can weigh close to a pound each. Rome Beauty – Beautiful dark red apples that keep their shape when cooked. Granny Smith – A classic tart variety from Down Under. Super tart when picked green, these have a slight pink blush and pleasant sweet/tart flavor similar to MacIntosh when fully ripe. Late (standard) Fuji – One of our latest apples picked in November. A little larger than the early variety, but same great taste and a good keeper. Pink Lady – A complex-flavored customer favorite that seems to get sweeter with each bite. Often not ready until right around Thanksgiving. Cold temps bring out their flavor, and sometimes we have to brush snow off them! From out of the area? © 2019 Fruit Basket. All Rights Reserved. Website by Flexiss Digital Design.